Sun Sing Pastry is a small store that carries dim sum; most customers get dim sum to-go but there are small tables for dining in. My parents and I grabbed a couple items here; we had to get the sesame balls with red bean paste, as it is similar to the sesame balls with mung bean! Glutinous rice balls with red bean paste filling and sesame seeds on the outside. Jian dui (Mandarin) or jin deui (Cantonese), is a type of fried Chinese pastry made from glutinous rice flour. The pastry is coated with sesame seeds on the outside and is crisp and chewy. Inside the pastry is a large hollow, caused by the expansion of the dough. 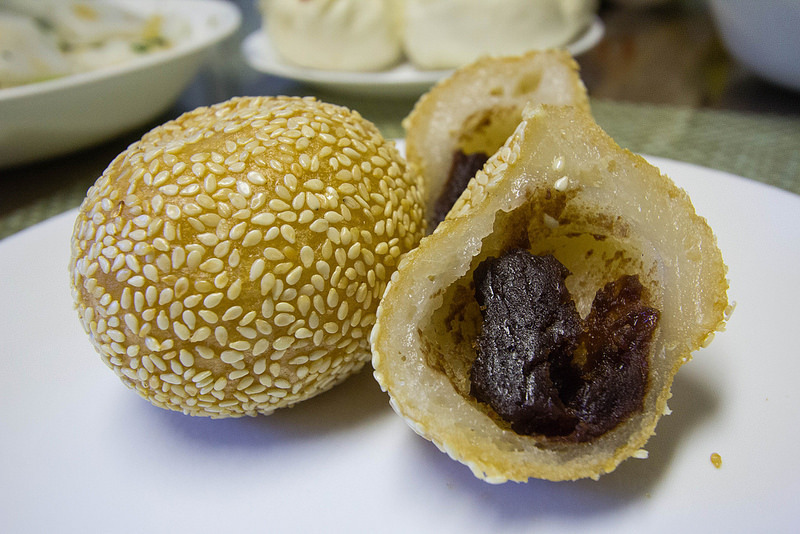 The hollow of the pastry is filled with a filling usually consisting of lotus paste (蓮蓉), or alternatively sweet black bean paste (hei dousha, 黑豆沙), or less commonly red bean paste (hong dousha, 紅豆沙). The origins of jian dui can be traced back to the Tang dynasty as a palace food in Chang’an, known as lüdui (碌堆). This food item was also recalled in a poem by the Tang poet Wang Fanzhi. With the southward migration of many peoples from central China, the jian dui was brought along and hence became part of southern Chinese cuisine. In Hong Kong, it is one of the most standard pastries. It can also be found in most Chinatown bakery shops overseas.